Suscram Rising Sun Route - Suscram. Rising Sun Country Park is on the site of a former colliery and is great place for all the family. It has lots of different activities like a childrens play ground and a Cafe with toilets. There is also a large hill for more experienced bikers to ride down. There is a nature reserve with good opportunities for bird watching. Start by leaving Cramlington Learning Village gates turn right and go straight down the cycle track. Then through the underpass and at Alexandra Park - keep right. 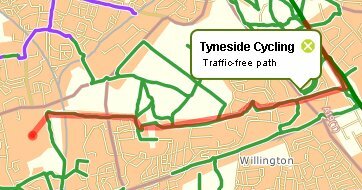 Go straight down the cycle path, which follows the route of the West Cramlington Wagonway, until another underpass across from the Bayhorse Pub. Go through the underpass, passed the allotments and through the woods and field until you reach the Big Spoon. You will then come to a 3 way junction. Go down the right track, through the field and straight on until you reach a house on the left corner, when you reach the house turn left and carry on down the road. Then go up the slight bank and you should be at a road, cross the road over onto some fields. Keep going along this track until you reach a housing estate. Keep going the same way through Seghill, along Barras Avenue and across the A190. From there you will continue along the route of the wagonway going in the same direction. This track follows the edge of a plantation before reaching a three way junction. You need to take the first turn to the left. The wagonway bends round the old pit heap of Backworth 'B' pit, and begins to run parallel to the mineral railway line. This section of the route is a small part of the Burradon and Holywell Wagonway. At the gate turn right and cross the railway line. Follow the road a little then turn right. Pass the cattery and keep right onto an unused road. Follow this road and keep right, heading for the new bridge of the Shiremore by-pass. Pass under the bridge. The route runs along the side of the mineral railway line again. You are now following the route of the Cramlington Wagonway. Continuing down this track, you will see the Blue Bell pub on the A186. Just south of this pub, on your left, you will see the site of the Bluebell pit and the small mound of its old pit heap. Follow this wagonway through Battlehill until you see the pit heap of the Rising Sun Colliery in front of you. Turn right at the sign for the Rising Sun visitors centre. If you want to go to the top of the pit heap look out for the track on your right. The pit heap is a big hill that is great for older children and adults who are confident with going down steep hills. Otherwise, follow the road through the farm and past the stables. Go straight across at the next junction and turn right at the T-junction towards the Visitors Centre. Here is a great place for lunch as it has a playground for younger children, picnic tables to have lunch outside and a cafe with toilets. If you have entered the Visitors Centre, turn right at the gates on the way out and follow the road towards the A186. Benton Asda will be on your left. Cross the road onto the pavement and turn right. Cross over the roundabout and follow the road through Holystone and turn left after the pub. Follow a track that passes over the Metro Line and through Holystone Farm. The track continues through the fields and up the hill towards East House Farm. You will meet the B1317. Turn right and go along the road for about 100metres. Look for a sign showing the route of the Seaton Burn Wagonway. Follow this track until you pass a farm shop and reach the A1056. Cycle down to the pedestrian crossing and cross here. In front of you there is a road that heads into a housing estate. Follow this and look out for the track on the right. This track heads towards Burradon House in a northerly direction. At Burradon House bear right and continue north following the footpath which runs along the edge of the field. Head towards the A190. At certain times of the year, these fields can become over grown which may not be a suitable route for young children. Cross the A190 on to the footpath and turn right. Pass under the A19 and turn left at the roundabout. Take the first right down to Seghill Bridge. Cross the bridge and just after the entrance to Seghill Hall, take the footpath on the right. You will cross a stream and return to the route of the West Cramlington Wagonway. Turn left towards the Big Spoon and follow the track all the way back to Alexander Park and then Cramlington Learning Village.